Microsoft is beginning the official rollout of the Windows 10 launch tomorrow and PerfectDisk 14 Pro (Home Edition) is now here with Windows 10 support and S.M.A.R.T. enhancements for HDDs and SSDs! PerfectDisk is the world’s leading disk defragmentation and optimization utility, used by large enterprises, small businesses, and home users to maximize the performance and reliability of their laptops, desktops, servers, and virtual environments. 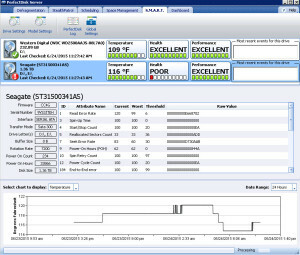 S.M.A.R.T (Self-Monitoring, Analysis and Reporting Technology) is a self monitoring technology that modern hard drives support. This technology allows you to monitor the important parts of hard drives, warning you if their condition is getting worse and if data loss is possible. 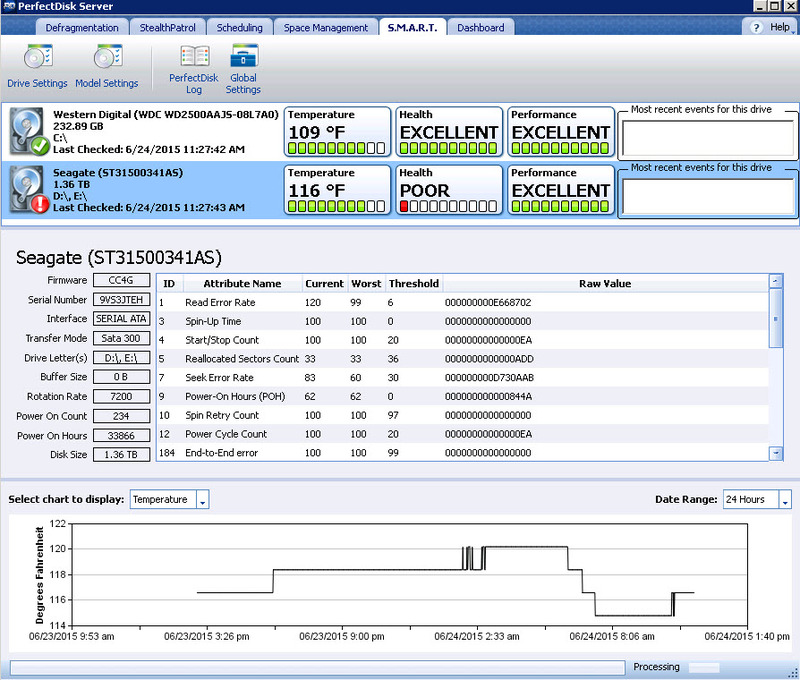 Raxco’s PerfectDisk uses this technology and allows you to monitor your machine through the S.M.A.R.T. Information tab. So, SMART is really a warning system — designed to warn the user of impending drive failure while there is still time to take action, such as copying the data to a replacement device. There are often certain indicators that tell drive failure is imminent. They may become overheated or have trouble reading and writing data, or part of the drive may be damaged. Now, SMART is not for everyone. But there are a lot of users who find great value in this type of information — at a glance, they can determine if there is an impending problem with one of their drives, besides possible fragmentation, of course. 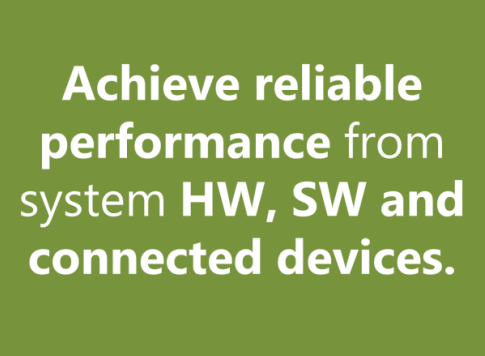 SMART monitoring, together with drive optimization, ensures drives are as fast, efficient, and healthy as possible. 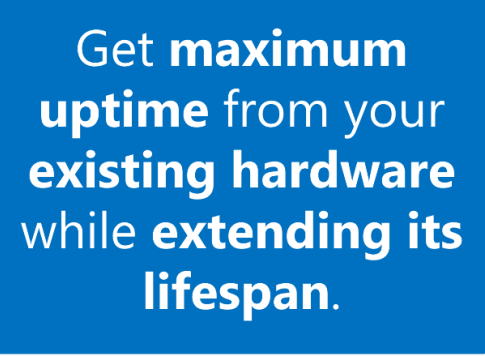 It’s the next generation of disk optimization and performance monitoring. PerfectDisk displays S.M.A.R.T. information in either Basic Mode or Advanced Mode. Basic Mode only displays drive temperature and drive health. Advanced Mode displays more detailed information about the drive. PerfectDisk 14 Pro for home users was launched to coincide with the Windows 10 release. PerfectDisk 14 for Home Server and Business Editions (Professional, Server, Hyper-V, vSphere and Enterprise Suite) will be available in the Fall of 2015. 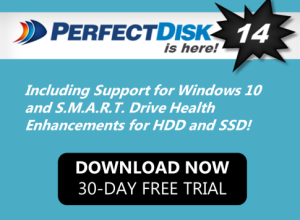 WINDOWS 10 UPDATE – Monday, August 10, 2015 – If you are an existing PerfectDisk customer UPGRADING an older version of PerfectDisk to PerfectDisk 14, you must upgrade to PerfectDisk 14 PRIOR to installing Windows 10. If you upgrade to Windows 10 prior to upgrading to PerfectDisk 14 you will encounter errors. Download the fix here. Error text: The paramete is incorrect. I was previously running PerfectDisk 13 Pro on Windows 8.1 but did not remove it prior to updating to Windows 10 Pro on 16th July 2015 as at the time I was not aware that it would not work. Of course, it didn’t run and I was politely told that it would not run post-Windows 10 install. I had to run PerfectDisk Cleaner as I could not even uninstall it because it was incompatible with Windows 10!!! PerfectDisk Cleaner did not actually remove the program as all the files were still installed in C:Program Files\Raxco\PerfectDisk folder. I even tried uninstalling PerfectDisk 14 from Windows 10 then ran PerfectDisk Cleaner but, again, all the files were still left in the Program Files\Raxco\PerfectDisk folder. I had to manually delete them! Apparently it had worked for some but not all. Sorry for the inconvenience, glad to hear you were able to resolve the issue yourself. How much is it, please? @ Lauren Lembo – Thank you for trying to help by posting the link. Unfortunately, I cannot fix the error. I have tried repairing PD14Pro from Program and Features to no avail. I have even uninstalled PD14Pro, ran PDCleaner, rebooted, deleted the files in the C:\Program Files\Raxco\PerfectDisk (since the uninstaller does NOT remove them!!!) then looked in the hidden Application Data and ProgramData folders to delete any PerfectDisk folders. ran CCleaner to remove the registry references and reinstalled the software. After that I re-ran PDCleaner then rebooted and finally reinstalled the software again with the exact same error. Is anyone getting this who, like me, left PD13Pro installed prior to doing an upgrade install to Windows 10 Pro build 10240? Fortunately, the software seems to be otherwise working fine but I am obviously losing out on some of the functionality since I can access the Global Settings. I have contacted support as well. Support should be able to help you out now, I’ll forward them your comments from here. Clearly I meant that I canNOT access the Global Settings (need to really proof-read my posts before actually posting them! I have contacted support for you. They will need more information on your system to help you out. I can’t uninstall PD13 and I can’t install PD14 on the RTM of Windows 10. PD14 upgrade will not install under Windows 10. Error message: This version of Perfect Disk cannot be installed on Windows 10. Your system has not been modified. I also have error when entering the Global settings. I had PD13 when I upgraded to win 10. I used the cleanup program to uninstall PD13 and then install PD14. Ok fixed the Global Settings error. I guessed right that previous settings in the registry was causing the issue. I used Revo Uninstaller Pro trial to uninstall PD and to get rid of all the settings in the registry. I installed it PD14 and now I can get into the Global Settings. Daz1967, if it makes you feel any better, I have just the same error, and another probably related. I’ll be putting in a support ticket on it. – just purchased PD14 ‘upgrade’. – tried to properly remove PD prior, 12 or 13, don’t remember. Failed as the uninstaller refused to run ‘not operable on this machine/os version’. Hmm. – PD seems to run, and while we speak, it is defragmenting. Somehow prior PD or the W10 upgrade had collected 264 fragments in Metadata, which it sorely admonished about. – However, two things. If I try to reach Global Settings, I get a ‘parameter incorrect’ just like yours. I think someone forgot a little testing. As well, I set up a scheduled operation, and then said to run it now. Nothing happened except a switch to the main screen tab, then silence. I suspect this has to do with Global Settings, perhaps, also. Ok, off to put this into a support note. Good fortune, and I will look for same. p.s. The way I got PD to run was just to manually start a disk from the main page, after the task script start didn’t do it. The same when it finishes to do the other partition, until tasks work properly. I have a smallish SSD, 64 GB. Just upgraded to Win10 and PD14. No matter how many times I run the SSD defrag on my SSD, the recommendation is always “Since free space fragmentation is high on this drive, consider performing a SSD Optimize pass to improve system performance”. I don’t honestly remember what it did before under Windows 7 and PD13. At first, after the upgrade, the drive was fairly full. But I deleted the backup files and installation files, ran drive cleanup, etc. And it is now under half full. And I still always get the same recommendation no matter how many times it is run. I’ll send your feedback to development. I have submitted a support ticket to you. Look out for a response at the email you used to register on our blog. I forgot to mention. Thanks for keeping your prices reasonable. I’ve been a user since around PD 5 or so, don’t remember exactly. But its always been a fair price. I have a lot of PC’s in my family. Maybe 8 or so. If I had to pay like $50 each for PD, I wouldn’t do it. But with your reasonable pricing, it is always worth upgrading. SMART also doesn’t recognise two SSDs in my PC. One is connected via giagabyte motherboard on SATA 2 connector and the other one is connected via Marvel SATA 3 card in PCI-e slot. Is this in PD14? I will report to development. Yes, in PD14 (build 865). OS is Win 7 pro x64. I have two WD 1TB HDD that show up correctly. SMART info for SSDs is shown correctly in CrystalDiskInfo 6.5.2 x64. I spoke to tech support and they say that while we improved SMART drive capabilities in PD14, there may be instances where we still are unable to detect a SMART-enabled drive. I also have the same issue – did not uninstall PD 13 before upgrading to Windows 10. When I tried to install PD 14 – I get a prompt telling me that it cannot be installed to current Windows version. I want to replace PD 13 with PD 14. Hmm. I believe I had left a detailed reply as the person daz1987 requested, as I’d also had results like his. However, it seems to have been lost or deleted? i also raised a support case, and got a decent reply after the weekend. As I’d managed to remove the prior PD via the Deinstaller prior to installing PD14, what I needed was for the Global Settings and manual activation of schedules to work. Support sent me a registry file to install for this; a bit scary without a signature on it, but I looked at what it contained and installed it. This brought PD14 to apparently working correctly. Honestly, with I think about 8 months to prepare just as all other vendors, I think Raxco should have had the upgrade working smoothly on Windows 10. I hope you will soon fold the fix into the normal installer. The reason to use PD has been that it was technically sound, rather than with all the marketing as others do. I would suggest that is your strong point to be protected, thus protecting all who use your products. I tried to install Perfectdisk 14 on my Windows 10 Enterprise and the installation process informs me that this version of Perfectdisk 14 will not run on my operating system! I have two SSD’s not HDD’s, is it S.M.A.R.T. related?! . Is there any workarround? Support has responded that the link I provided in my last comment is the correct fix for your issue. Hi Global Settings is not working. Tried Repairing, remove, reinstall unfortunately doesn’t work. Hi, On finding out the PD13 did not work with Windows 10, I checked this site, downloaded the “Remove PerfectDisk.zip” files and followed the instructions. I then bought PerfectDisk 14 and installed it only to find that the Global Settings did not work. The error message is “Failed to Retrieve Perfect Disk Settings due to error, The System cannot find the file specified, Return code 0x80007002 (2147942402)(app-cpp/#1847. Quite simply Raxco this is unacceptable !!! Support has been updating the instructions at that link, for some reason it worked for some but not all users, again, we apologize for the inconvenience. I am now on my second problem with PerfectDisk14, the first was that Global Settings would not work, even having carried out the instructions as per http://na13.salesforce.com/_ui/selfservice/pkb/PublicKnowledgeSolution/d?orgId=00D30000001FVTK&id=501a0000000whAt. I raised a support ticket and they sent me a zip file with a workaround fix for the registry which resolved the issue of Global Settings not working. I then decided to carry out a Boot Time Defrag which failed to complete putting my PC into a continuous loop of “Preparing Automatic Repair” Windows 10 screen followed by a “Diagnosing Your PC” Windows 10 screen. The only way that I could get my PC to work was by carrying out a system restore. was totally unacceptable, not unsurprisingly my previous entry has been removed. No doubt the moderators will remove this post as well. I WOULD ASK THAT THE MODERATOR LEAVES THIS POST IN ORDER TO MAKE OTHER USERS AWARE OF THIS ISSUE. Reference my previous post of August 16th 2015. I ran chkdsk /f /r C: as instructed, chkdsk ran and stopped at 11% and remained at this figure for over six hours without any further progress being made. I powered down my PC and on restarting it started very slowly, I than re ran chkdsk again. This time I ended up with a Windows 10 error screen informing me that my PC had failed to start correctly and that a “restart” may resolve the issue. Unfortunately the PC then went into a continual loop of “had failed to start correctly and that a “restart” may resolve the issue”. The only thing that I could do was to restore my PC from a previous back up, I completed the restore from backup, uninstalled PerfectDisk14, re ran chkdsk which performed correctly, checking to 100% and reporting no errors. Were responsible for corrupting some of my system files resulting in my PC being failing to start up. This leads me to believe (along with all the comments in the PD14 blog), that PerfectDisk14 has all the appearance of a product being rushed to market without all the necessary testing having taken place. I have been a loyal user of Raxco PerfectDisk since 2008 having been very impressed with the product and recommending it to my many friends and business colleagues. Given the problems that PerfectDisk14 has caused me i.e. loss of PC use and the considerable stress that this has caused me, having uninstalled PerfectDisk14, I will not be reinstalling it. I have now contacted Consumer Support and requested they refund the purchase price to me. Error code 1393 translates into “the disk structure is corrupted and unreadable.” PerfectDisk detected during the boot time defrag process that there was an issue with the drive and PD refused to run. Microsoft’s solution to identifying/resolving disk issues is to run CHKDSK – which he started to run. However, since he did not wait for CHKDSK to complete – but instead did a hard reboot/reset of his system – it is no surprise that drive corruption occurred and Windows wouldn’t boot. One of the last things that you ever want to do is to do a hard reset of a computer as it can result in drive corruption. A quick Google search will find horror stories of Windows not booting after somebody does a hard reset of their computer. “One of the last things that you ever want to do is to do a hard reset of a computer as it can result in drive corruption”. However I believe that he is missing my points. Prior upgrading to Windows 10 and PerfectDisk14. I was running Windows 8.1 and PerfectDisk13 on my PC. I frequently ran PerfectDisk13 “Boot Time Defrag” which has never found any issues, indeed I had only run “Boot Time Defrag” that morning before upgrading to Windows 10 and it completed OK.
On upgrading to Windows 10 the only software program that did not run on my PC was PerfectDisk13, why was that? I checked the Raxco web site and they recommended using a work round to remove PerfectDisk13 which I carried out following all their instructions. I then purchased PerfectDisk14 only to find that the “Global Settings” did not work, I contacted Consumer Support who supplied another work round to rectify this issue, this enabled “Global Settings” to work. I then ran PerfectDisk14 and optimised my C drive and this worked fine. Following this I decided to carry out a “Boot Time Defrag”. This stopped at 39% and did not progress any further, I contacted Consumer Support once again and they provided a further work round fix. I ran “Boot Time Defrag” once more which did not complete ending up with the comment unable to verify disk. Once again I contacted Consumer Support who recommended running chkdsk /f /r C: I then ran chkdsk which quickly stopped at 11% and did not progress any further. After approx. six hours of no disk activity as indicated by the disk activity LED not flashing and also by no audible disk activity noise coming from my C drive I reluctantly decided to carry out a hard reboot/reset of my system as there was no other apparent option open to me. When I restarted my PC I ended up with a Windows 10 screen telling me that my PC had failed to start correctly and that a restart may solve the problem. This ended up being a continual loop without any option to restore from a previous restore point, carry out a repair etc. The only way that I could get my PC to work was by restoring it from a previous backup. I restored my PC back to Windows 10 and uninstalled PerfectDisk14, ran a chkdsk command and it ran to 100% reporting no issues. Raxco rushed out a new version to the market place (that the user had to purchase and thus generate income) without fully testing the software. I have now decided not to reinstall PerfectDisk14 given the above problems. The only reassuring thing that has come out of this sorry saga has been the prompt, courteous and professional support provided by the Consumer Support Dept. and Susie in particular. In conclusion, I have been a very satisfied user of PerfectDisk from PerfectDisk 2008 to PerfectDisk13 and as such I may once again purchased PerfectDisk, but certainly not in its current version. I am now closing my comments on your blog. Jim Isn’t the only one who has experienced these issues with Perfectdisk 14 and Windows 10. Thank you Jim, for your elaborate description of the matter, saving me lots of typing. Even though the steps taken differed on details, I second his conclusion that this is a rushed product, after losing half my weekend a week ago, trying to get back into Windows, after the continual loop Jim has described above here, was preventing me from doing so. I am certain this error and consequent loop was caused by PD14 boot time defrag. My system is (and was, in part thanks to PD13 runnning on it) in fine condition when I started it, yet, after the system restart initiated by PD14 after boot time defrag, the system kept telling me to reboot. By some investigating discovered that the drive/path mapping had been screwed up (system disk had gone from C: to E:, etc) hence; Windows was unable to start. Of course this kind of stuff happens on an early Saturday morning when no support is available for two days. After much online reading I ended up diving into elevated prompt and use BCDedit to rebuild my boot config files and Diskpart to get active partition corrected after remapping drives to their default again. I have used the cleanup tool, and also did a repair on PD14 as instructed in the link that was dropped by Lauren as ‘solution’ many of times, but still have the global settings error today, and I certanly wouldn’t dare initiate another boot time defrag with this build, to be honest. Considering I’d already felt cheated out of my money after buying PD13 in March ’14, and basically getting the exact same software by paying for a ‘new’ version (where the only thing new I think, is the version number), that is ‘Windows 10 compatible’. Well, for me and Jim, evidently it wasn’t. My drives all test(ed) healthy, and there’s no interrupted chkdsk repair process here, and frankly, I find the replies Jim got about it too easy. Pretty sure this is the last upgrade I’ve bought of this product. With over 75 million devices now running Windows 10, it is impossible for any software manufacturer (including Microsoft) to test against that many devices/scenarios. Some customers may have issues removing an incompatible version of PerfectDisk from their upgraded Windows 10 system. However, once PerfectDisk 14 is able to successfully be installed, the vast majority of PerfectDisk 14 customers run on Windows 10 without any issues. As with PD 12, which was made to work with Win 8 with a modified reg key, the same applies with v13 and win 10. The website has not been updated as the 20% speed increases do not seem to relate to PR13>14, but from PD 12 to 13. PD 14 added Windows 10 compatibility and S.M.A.R.T. enhancements. Migrated to Win10 without updating the PD13, however FIX error corrected perfectly. Thanks for support to users. boot time defrag is locking the system restart on windows 10! my pc is completely gone! i tried everything to restore but is says there is no restore point. I’m disappointed!! my pc only starting with the safe mode! how can I disable boot time defrag thing? uninstall not working on safe mode. Hi Stephan, I apologize for the delay. Your question has been submitted to tech support. You will receive a reply from one of our support reps via email. I have also had this problem and have never had a previous version of PD installed on my laptop. PD 14 was running fine on Windows 10 until I upgraded to the latest version of Windows 10 on 11-19-2015. However I was attempting to test “Prep for Shrink” and suspect the problem may be related to that. I have sent a support ticket in for you, they should be reaching out shortly. Getting a run time error when I tried to run PerfectDisk in Windows 10. “PerfectDisk is not supported on this version of Windows” I have a licensed copy. Is there a free upgrade to version 14? I have submitted a ticket for you with customer support. They will be reaching out shortly.